music This song was a big hit for The Seekers.The easy to follow letter notes are included.The sheet music is in the key of D Major. It's a lovely tune to play regardless what instrument you play it on. I play it on tin whistle and it sounds great. It's probably a step up from a beginners lesson by worth learning. The banjo / mandolin tuning is GDAE. The Seekers mandolin and banjo tab for A World Of Our Own. 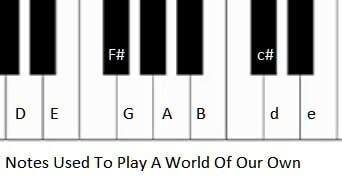 A world of our own music notes for beginners.